The Promoting Professional Accountability (PPA) programme provides healthcare organisations with a sustainable, organisation-wide framework to achieve the highest levels of safety and reliability. It helps to identify, engage with and hold accountable staff who demonstrate repeated unprofessional behaviour. This evidence-based programme provides a framework for defining critical safety and professionalism standards, and identifying, measuring and addressing behaviours that undermine them. Cognitive Institute promotes and supports development of an organisational culture where all staff feel safe to speak up about any safety issue and the receiver welcomes it. However if speaking up face to face is not possible, safe or effective and not related to imminent patient harm, there is an important role for the organisation to represent a staff member and share the message on their behalf. The PPA programme ideally works alongside the Speaking Up for Safety™ programme to embed an organisation-wide speaking up culture. Research and experience has identified that unprofessional behaviour regularly goes unaddressed by colleagues and leaders as it can be difficult to define. It is often open to interpretation and frequently challenged. The Promoting Professional Accountability programme helps organisations quantify unprofessional behaviour and contextualise it in terms of ‘unsafe care’, providing leaders and organisations with the confidence and mechanisms to address it. The programme builds on the professionalism and commitment of the majority of staff, while ensuring the actions of no one individual can undermine a culture of safety and reliability. The Promoting Professional Accountability programme is based on the work of the Vanderbilt Center for Patient and Professional Advocacy in the United States. Extensively researched and published research discusses the effectiveness of the programme, or its components, in areas relating to hand hygiene, self-regulation and reduced complaint risk. Cognitive Institute has the exclusive licence to deliver the Promoting Professional Accountability programme for Australia and South East Asia. Our faculty have undertaken intensive training and accreditation from Vanderbilt Centre for Patient and Professional Advocacy (CPPA) to be able to deliver the PPA programme in this region. Cognitive Institute delivers this programme under strict licence terms and conditions. The success of the Promoting Professional Accountability programme is maximised by an organisation-wide, three-stage approach: commitment, readiness and implementation. Your investment covers all aspects of these three stages including considerable senior leader training and facilitation, peer-messenger and all-staff workshops. This model ensures commitment to a ‘no blink’ approach by board and executive leaders. The Commitment stage is aimed at informing the board, executive and senior medical clinicians about the PPA programme, their role in its implementation and the level of commitment required for its success. This stage assesses the organisation’s readiness and prepares the organisation to implement the PPA programme. The final Implementation stage provides the necessary training required to implement the PPA programme. It includes all-staff seminars, peer messenger training, leadership training and coaching and feedback support for leaders and peer messengers to support their ongoing effective implementation and ensure a sustainable programme. Critical to the success of the PPA programme is its innovative approach of delivering informal conversations about single reported incidents, utilising carefully selected, expert trained peer messengers. In addition to selecting and training peer messengers, the PPA programme delivers training to leaders throughout the organisation to provide them with the skills required to support the programme. Understanding common excuses, rationalisations, denials, and barriers to change prepares leaders to appropriately, consistently and professionally address the real issues related to addressing unprofessional behaviours. The Promoting Professional Accountability programme is a powerful intervention that can transform your healthcare organisation’s culture. However, poorly implemented it can jeopardise expected gains and may even worsen an organisation’s culture of professionalism and accountability. engagement of clinicians at all levels. Published research has discussed the effectiveness of the Promoting Professional Accountability programme, or its components, in areas relating to hand hygiene, self-regulation and reduced complaint risk. Another study has shown that most physicians who receive interventions respond with an 80% reduction in their complaint risk score4. accountability and financial incentives. Infect Control Hosp Epidemiol 2013; 34(11):1129-36. California: Alpha Omega Alpha Honor Medical Society 2015:81-98. 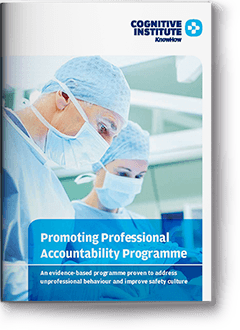 The Promoting Professional Accountability programme is an organisation-wide initiative and costs vary according to the size and nature of each healthcare provider. An evidence-based programme proven to address unprofessional behaviour and improve safety culture. The Promoting Professional Accountability (PPA) programme provides healthcare organisations with a sustainable, organisation-wide framework and training to achieve the highest levels of safety and reliability.